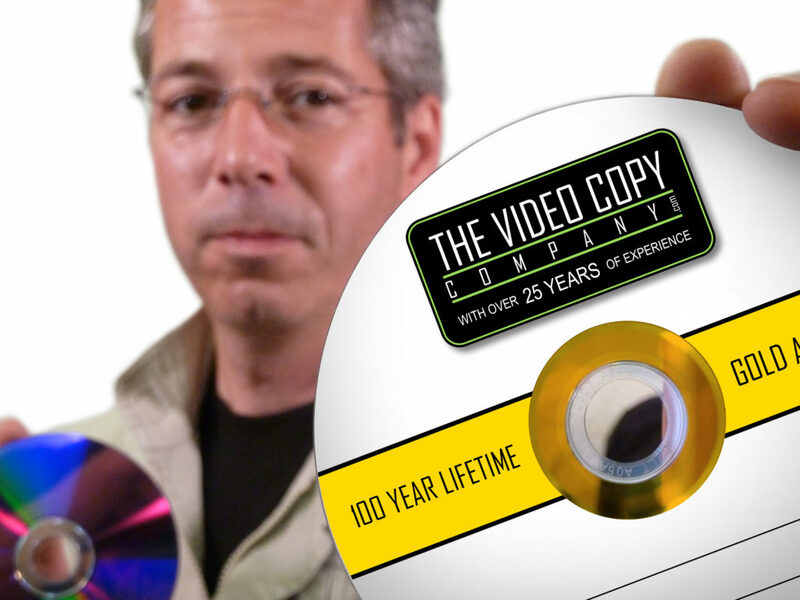 Here at TheVideoCopyCompany, our team of video experts are on a mission to highlight the possible dangers of storing your precious memories and important documents on standard DVDs and CDs. When the first writable and recordable discs started to arrive on the scene around 1999, they seemed the perfect way to record anything you wanted to retain; a brilliant tool, allowing those priceless memories to be stored digitally. Ten years on and some rather disturbing facts are emerging about the life expectancy of the discs. The latest research concludes that ALL standard writable DVDs and CDs do in fact have a life span, and in the worst case scenario, some cheaper discs may only last for 2 to 5 years. These discs contain an organic dye which, over time, will deteriorate, rending the disc unplayable. Here at TheVideoCopyCompany, we have software that can recover some, if not all data from the damaged DVDs and CDs but there is nothing else that can be done when this ‘disc rot’ occurs. GOLD ARCHIVE disc have now arrived. As the name suggests, actually utilise REAL GOLD as part of the dye. These new discs have a much superior life expectancy of around 100 years, provided you store them properly, in a vertically rested case, away from direct sunlight and protected from dust and dampness. Whether it is your precious camcorder memories or important documents and videos at work, the solution is the same – TRANSFER YOUR DVDs AND CDs TO GOLD ARCHIVE DISCS IMMEDIATELY! Here at The Video Copy Company we can do the transfers for you. Just bring the original disc to our store and we’ll professionally transfer it’s content to a Gold Archive disc. Alternatively if you are confident enough to do it yourself, TheVideoCopyCompany will happily supply the discs and cases. NB: Dual layer DVDs have to be copied to two Gold Archive DVDs. Our Gold Archive discs integrate a double reflective Gold and Silver layer to ensure the highest compatibility. The Gold layer offers maximum resistance to environmental deterioration, especially data corrosion which is one of the major causes of disc failure in standard media. The silver layer delivers high reflectivity and broad drive compatibility. These Gold Archive discs have been rigorously tested by the manufacturers in accelerated ageing tests under severe storage conditions, such as high temperature and high humidity. The results confirm safe storage of information for more than 100 years.